Saturday afternoon hockey is back for the first time this season as we get treated to matinees in Madison Square Garden and Philadelphia! It’s always great to have a full Saturday of hockey to watch. Thursday was our toughest night of the young season as we lost all 3 of our picks, dropping to 10-6 on the year. The leans we posted on Twitter and Facebook last night went 2-1 with a push, so hopefully Thursday was just a blip and we’ll get right back on track today. Before we get into today’s breakdowns, picks and opinions, we just wanted to thank everyone for the great interaction we’ve enjoyed already this year through the site and on social media. 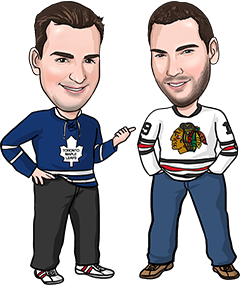 It’s always a lot of fun to talk some hockey, especially from a betting perspective. There’s a comments section at the bottom of every post we put up on our website where you’re always welcome to chime in with your picks for tonight, let us know what you agree with, what you disagree with, etc. We’re all here to help each other, so whatever info or opinions you may have can be a benefit to all of us. Alright, let’s dig into tonight’s 12-game schedule. Below you’ll find our 4 personal bets tonight plus stats, trends, analysis and any opinions we might have on the rest of the board. A lot of starting goalie matchups aren’t locked in yet, so you might want to double check on those before placing any wagers today. Reasons to bet Nashville: The Predators blanked Philadelphia 1-0 Thursday in Philly and have now allowed 3 regulation time goals in their last 4 games. New York has 1 win in its first 8 games, and is just 1-3-2 at home. Reasons to bet New York: The Rangers won both meetings last year and 4 of the last 5 head-to-head matchups. Nashville has scored 5 goals in its 4 road games this year. Reasons to bet San Jose: The Sharks have won 3 of their last 4 games, including a 3-0 victory last night in New Jersey. The Islanders have given up 3+ goals in 6 of 7 games this year. Reasons to bet New York: The Islanders are playing just their second game since Sunday while San Jose is playing its second straight night. New York is 1-0-1 at home. Reasons to bet Toronto: The Leafs continue to fill the net, scoring 4+ goals in 5 of their first 7 games. Ottawa has yet to win a home game this season, going 0-1-3 so far. Reasons to bet Ottawa: The Senators have dominated the Battle of Ontario recently, winning 3 of 4 meetings last year and 7 of the last 8 overall. Toronto has lost 5 of its last 6 visits to Ottawa. Reasons to bet Minnesota: The Wild has scored 16 goals in its last 4 games. Calgary has lost 2 of its first 3 at home and the Flames have been held to 1 goal or less in 2 of their last 3 overall. Reasons to bet Calgary: The Flames have swept the season series in each of the last 2 years, limiting Minnesota to just 4 goals in the last 4 meetings. The Wild is decimated by injuries and now has to play for the second straight night, this time in the high altitude of Calgary. Reasons to bet Edmonton: The Oilers have outshot their last 2 opponents by a total of 93-52, including Thursday’s 2-1 OT win in Chicago that snapped a 4-game losing streak. Philadelphia has lost 4 of the last 5 meetings, allowing 4+ goals in each of them. Reasons to bet Philadelphia: The Flyers have allowed just 4 goals in their last 3 games and have given up 2 goals or less in 5 of 6. Edmonton has scored 12 regulation time goals in its first 6 games. Reasons to bet Pittsburgh: The Penguins have won 5 of their last 6, and they’ve scored at least 4 goals in 6 of their 8 games this year. Tampa is playing its 4th game in 6 days. Reasons to bet Tampa: The Lightning beat Pittsburgh 5-4 in Tampa just 9 days ago. Pittsburgh played last night in Florida and allowed 3 goals for the sixth time in 8 games. Reasons to bet Buffalo: 3 of the Sabres’ points this year have come on the road, including their only victory. Boston has given up at least 3 goals in 5 of its 6 games this season. Reasons to bet Boston: The Bruins have won 7 straight meetings with Buffalo, limiting the Sabres to 8 goals in those 7 games. Buffalo was outshot 41-22 last night in a 4-2 loss at home to a tired Canucks team. Reasons to bet Los Angeles: The Kings are 5-0-1 so far and now open a 6-game eastern road trip. Columbus hasn’t scored a power play goal in its last 6 games and is 1 for 19 on the PP this season, while the Kings have allowed 1 power play goal in 24 chances this year. Reasons to bet Columbus: The Blue Jackets have outshot their last 3 opponents by a combined total of 117-68. Los Angeles is playing its first game since Jeff Carter got injured. Reasons to bet Florida: The Panthers have won 2 of their last 3 visits to Washington. The Capitals are 1-2 at home and have just 2 regulation time wins in their first 8 games. Reasons to bet Washington: The Capitals have won 14 of the last 19 meetings with Florida. The Panthers gave up 4 goals last night for the fifth time in 6 games. Reasons to bet Carolina: The Hurricanes are coming off back-to-back road wins over Calgary and Edmonton, and have allowed just 7 regulation time goals in their last 4 games. Reasons to bet Dallas: The Stars have owned Carolina at home for years, winning 12 of the last 13 meetings in Dallas. Carolina has been held to 2 goals or less in 3 of its last 4. Reasons to bet Chicago: The Blackhawks have won 7 straight meetings with the Coyotes, including 4 straight in Arizona. The Coyotes are still winless, allowing 4 goals or more in 5 of their first 7 games. Reasons to bet Arizona: The Coyotes need to make the most of their last home game before a stretch in which they’ll play 5 straight and 12 of 15 on the road. Chicago has scored just 6 regulation time goals in its last 4 games, and is playing for the third time in 4 nights. Reasons to bet St. Louis: The Blues have won 4 of 6 on the road and have limited opponents to 2 goals or less in 5 of their last 7 games. Reasons to bet Vegas: The Golden Knights have won 5 of their first 6 games, and their offense is clicking with 16 goals in their last 4. St. Louis is playing its 3rd game in 4 days.